fact: whether you're starting your first job or just got a third promotion, a stylish yet functional work bag (that won't interfere with your 401k) is one of the most essential wardrobe foundations. there are so many choices out there now that trying to shop for one at a relatively reasonable price point ($150-$500) can be overwhelming. one of my favorites is the convertible tote by Foley & Corinna (also here and on sale here). it has been around long enough to become an indie classic, and i find the design to be unique and effortlessly stylish almost ten years on. it's easy to get into and close. the vertical format is roomy enough for files and a laptop, while the foldover design makes it easy to transition into an oversized clutch or crossbody for after-work, weekend, or travel. there was a time a few years ago when the bags were inconsistent in quality, but it looks like the company has since fixed those production issues. the current city totes have buttery, thick leather and a well made, sturdy finish. the ultra lightweight zip tote // the original and still the best in value and design; foldable and packs away into nothing for travel. the basic leather carryall // pared-down but still stylish and spacious enough for the workday to weekend. the minimalist luxe tote // this is my go-to somewhat structured open tote (see my review); elegant, clean lines with an adjustable shoulder strap. the slouchy chic messenger // another low key chic design in a soft leather and utilitarian design. bonus: you can get yours monogrammed too! the portfolio clutch // not as roomy as the others, but a very chic portfolio/convertible clutch style with room for laptop and files (featured here). what's your go-to work bag? P.S. : more in the series: the best sandals under $100. Great post! Mine is currently the J Crew downing tote in black. I really like it (and the little wallet it comes with). I've heard mixed reviews about the Clare Vivier stuff but I love the design. I also have a red leather (slightly pebbled) messenger from Coach that I love. I always get compliments on it and people are surprised that it is Coach. But sometimes I feel like red is too flashy. What do you think? Definitely agree with you on the pliage - I have two and they both get a lot of use. Otherwise I love my Cuyana short tote. Kallie, that's great to hear! a number of friends love their CV bags too. and i've found the quality has been steadily improving season after season. Right now I alternate between a classic leather tote from Fossil and my Longchamp large Le Pliage tote. For work bags, I like for a bag to be roomy enough to fit my work essentials and my lunch but also fit over my shoulder leaving my hands free during my commute. These 2 bags fit the bill perfectly. This is a little off-topic, but I can't wrap my head around what room this photo was shot in! A bathtub... with a desk and a phone? Please illuminate! Tammy, it's the NoMad hotel :) it's such a lovely place! 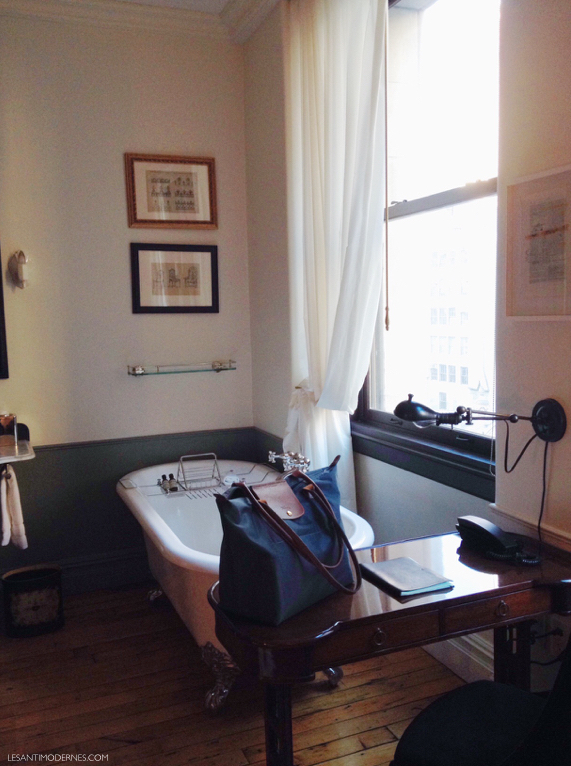 I recognized that tub immediately - the NoMad is my home in NYC - love it! I have two Pliages and they're the travel go-to. Thank goodness for the one with the long straps especially. I also have the Foley & Corinna Mid City and I can say that it caused such a stir that no fewer than six other women at my office have now bought one....we had to draw straws on colors. Unfolded it holds a laptop...so key. I wish I liked Clare V better but I am from her home area of Silver Lake and her flagship store is famous for a cold, snobby attitude better suited to Beverly Hills than to funky LA....so she os gitlcotted (?) by many locals. Lovely bag. I first ran across that brand at a marine supply store on my little island of Tortola BVI, of all places to purchase a luxury brand! (The island is not known for anything fashionable or remotely fancy, quite the contrary.) My go-to work bag is a cotton Rick Owens DRKSHDW tote. It was "free" (came with a clothing purchase). LeSportsac Medium Travel Tote in solid black. Understated and durable. Ditto LeSportsac. I have the Everygirl Tote in black for schlepping my laptop and would also describe it as understated and durable. I have the Longchamp Le Pliage in the same color you have, navy. It is so trusty and is still going strong three years in! I'm also using the Longchamp in black. Recently found out about Dagne Dover, quite curious about it but the price is quite intimidating. I work from home, so I can get by with casual. But my never-fails are my Clare V. messenger bag (bought before she lined them...lining is a good thing! ), and my J Crew English Saddle "Downing Tote. My night bag is a Clare V. fold over clutch in leopard. LOVE!